We appreciated doing business with you this year and look forward to working with you in the future. Myself and Cassie would like to thank you for your excellent service. Captain Alex and Chris did an excellent job putting us on and decking the fish for our trip on 10/15/2007. Even though the conditions were less then perfect (6-8 foot seas), the Sea Cross provided us with safe, stable and dry platform. 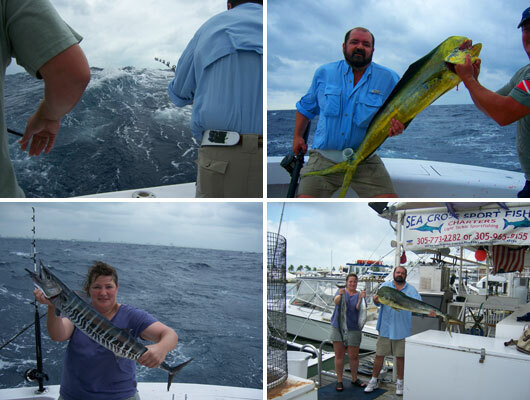 Over the course of the day we caught a plethora of fish including Tuna, Dorado, Kings and Wahoo with the Tuna and Wahoo being Cassie’s first. The memories this trip has provided are priceless and I can assure you we will give you a call on our next trip to Miami. Dr. James W DuMond Jr. I have fished from Nova Scotia to Costa Rica and many places in between and I can honestly say that this was truly the best & most action packed one half day fishing trips that I have ever experienced. As you know, this was my son Grant’s first saltwater fishing trip and I thank you and Alex for making it an unforgettable one. Grant landed a large Barracuda, numerous Bonita, a King Mackerel & a Sailfish... all before 10AM... quite a day and then you topped it off with another Sailfish for me. I have to say that when Alex went under the boat with a scuba mask to free a tangled line on the second sailfish, this was fishing dedication and customer service above & beyond expectations. Great job guys... you just hooked Grant on billfish and made me a regular customer. See you soon & thanks again. Thank-you very much for another great adventure on the Sea Cross, the trip has created a life time memory for me and my family. Our boys were very excited and your patience and guidance with them as new fishermen is greatly appreciated, they loved the entertainment and your positive and upbeat attitudes. If you ever require a reference you can count on me, I have enjoyed two great trips with the Sea Cross and look forward to being part of the platinum group of most excursions by an individual. I hope to be able to plan a multi day trip with you guys some time in the future, maybe we can chase down a Marlin on the next trip. 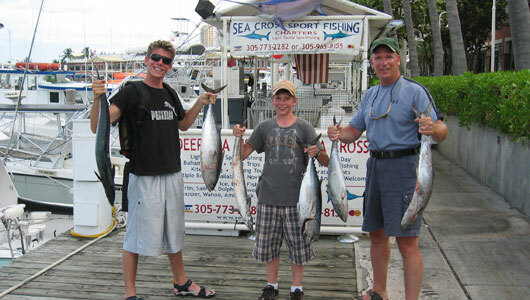 We made it home safe and sound, had the pictures developed and tell all of our friends to take a fishing trip in Miami with the Sea Cross. I just wanted to say thanks for the best fishing trip we have ever had!! You and Alex were awesome!!! We had fun all day, you gave us a work out pulling in all the fish. I will definitely be back, I will keep in touch to let you know the next time we came to Miami, we might even try a trip to the Bahamas. Thanks again, let Alex know that he did a great job!! We had a great day in Miami with the two of you last week. Here are some pictures to share with your next customers. We will see you again!!!! I wanted to let you know we had a great time with you and Captain Jack. Excellent customer service with updates and you all immediately made us feel comfortable and ready to have a good time, especially for us beginners. I would, and will highly recommend you to any of my friends. You can be sure you'll be hearing from me again on my next trip down to Miami Beach (my wife's jealous). I got some great shots of the water as well and can see how people love the open sea.